Romantic Rustic River Retreat...A Romantic Cabin On The Icicle River, Minutes From Downtown Leavenworth! Icicle Riverhaus...A Cozy Cabin On The Icicle River Just Minutes From Leavenworth! Property Size 1,008 sq. ft. 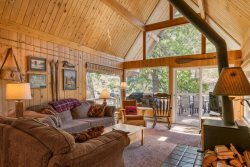 Couples will enjoy the cozy living room with stone fireplace, King bedroom, updated kitchen and 3/4 bath and the one of the most amazing vantages on the stunning Icicle River! The Icicle Valley is the hub of Leavenworth's recreational opportunities. Romantic Rustic River Retreat is a short .25 miles from the Snow Lakes Trailhead and minutes from other amazing hiking trails as well as rock climbing, Leavenworth Golf Course and many other activities. And a short 4 miles from Downtown Leavenworth and all of the festivities and shopping offered there. The perfect romantic getaway during any season! Relax and unwind at the Romantic Rustic River Retreat! Check in is after 4pm & Check out before 11am, unless otherwise arranged with management in advance. The river is a wonderful place to explore but please keep in mind that it is NOT safe to swim in this stretch of the river.